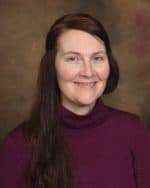 Kristy Gunnink is a Licensed Professional Counselor (LPC). She holds a Bachelor of Science degree in Recreational Therapy and a Masters of Arts in Counseling, both from Central Michigan University. Kristy has worked in Mental Health with Pine Rest since 1999. The first 12 years of her career was spent working with adolescents in a residential treatment program. Since 2011, Kristy has worked in the inpatient setting, during this time she worked with populations from young children to older adults covering a broad spectrum of needs and diagnosis. She also completed a counseling internship in the Residential Substance Abuse program. As a clinician, Kristy strives to provide a safe welcoming environment to support safety and growth. Treatment specialty areas include working with adolescents and adults with sensory impairments, trauma, mood disorders and substance abuse, focusing on CBT, Skill building and Strength based approaches.